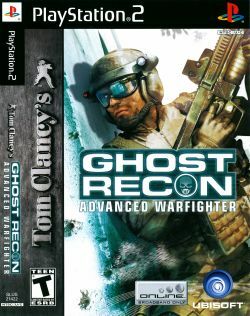 Game description: In Tom Clancy's Ghost Recon Advanced Warfighter you can play as a Ghost, the best trained and equipped soldier the US Army has to offer. The year is 2013 and an insurgency has broken out in Mexico City, and it is your job to infiltrate the city and attempt to restore order. You will need to rely on your superior equipment, weaponry, and training to succeed against a larger force of enemies. Ghost Recon Advanced Warfighter also features both cooperative and competitive multiplayer. Captain Scott Mitchell commands the fictitious elite Ghost Recon team in an attempt to protect the Presidents of the U.S. and Mexico, recover stolen U.S. technology, and battle the rebellious Mexican forces. Written by Gérard Lehiany, the story unfolds entirely in a realistic and detailed modeling of Mexico City, one of the world's largest cities. It is this size that allows Ghost Recon Advanced Warfighter to provide multiple locations like in previous Ghost Recon games, ranging from heavily industrialized areas to local parks and landmarks to office districts. PCSX2 1.3.1 20151220132053 GSDX OGL SPU2-X EE/VU Clamp modes: Normal/Normal. EE Cyclerate: level -2, VU Cycle stealing: level 3, INTSC spin detection enabled, Wait loop detection enabled, Fast CDVD disabled, mVU Flag Hack enabled, MTVU disabled. Lower half of the screen is glitched, and it's a bit brighter than the upper half of the screen. Night vision is blank on the lower half of the screen. Software mode fixes the problem as usual. This page was last edited on 28 September 2018, at 11:30.